I’ve been saving this recipe for ages. Why, you ask? Well, I don’t really know. It’s one of my favorite recipes to make, it’s totally versatile, it’s a meal in a pot, it’s gluten free and healthy…do I need to go on? I was going to post this forever-ago, then I got side tracked with stuff like purim and I kinda forgot about this recipe. Then I cooked it for supper tonight (it’s simmering on my stove right now and it smells amazing and I was all oh. I never posted this recipe. And then I realized how passover friendly this recipe is, and I knew it was going to have to get featured. Regarding passover (who gets all stressed out when I start discussing Passover? Just me? ), this recipe’s versatility comes into play if you need to make this conform with your customs. For example, my family doesn’t eat mushrooms on passover. Tough, but that’s what I have to deal with. Oh, and we don’t eat garlic either. Good news. Skip the garlic. Replace the mushrooms with some zucchini. Throw in a handful of tomatoes or cherry tomatoes if you’re so inclined. Don’t use red wine vinegar? Well I am sure you use wine, right? You’ll love this recipe no matter how you change it! Heat oil a large pot over a medium flame. Sprinkle chicken on all sides with salt and black pepper, and place in pot. Brown it on all sides, turning every few minutes to brown it all evenly. Remove chicken from the pot and set aside. Without washing the pot (you want the drippings from the chicken to add flavor to the sauce) add the diced onions and sautee for about 5 minutes, until translucent. Add the mushrooms and sautee for an additional 15 minutes. Add the chicken back into the pot, burying it under the vegetables. Add the broth, parsley, salt, garlic and vinegar. Cover and let simmer on a medium-low flame for about an hour and a half, until the chicken is cooked through. Stir the sauce occasionally to make sure the liquid doesn’t all evaporate. 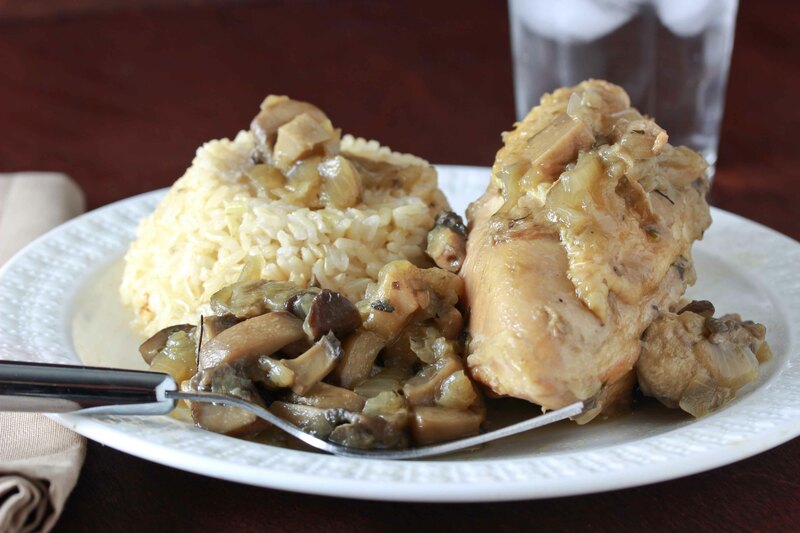 Note that cooking time once the chicken has been returned to the pot will vary depending on the size of the chicken. Adjust accordingly. 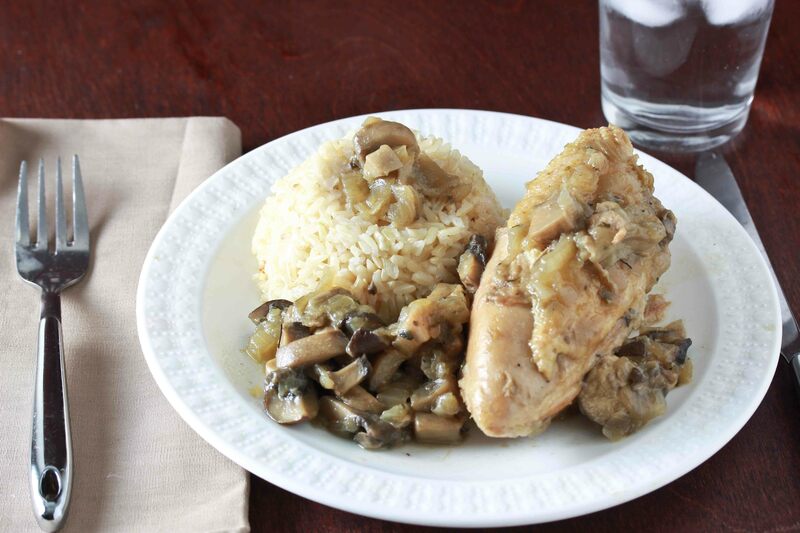 Serve hot, over rice – or mashed potatoes for passover. This looks so delicious, I think I’m going to try it for supper tomorrow night! I just so happened to have bought mushrooms this week! All I can say is yum and thank you. Thank you, will certainly be making this one! It looks divine! This looks like such a perfect dinner! Definitely one to try! 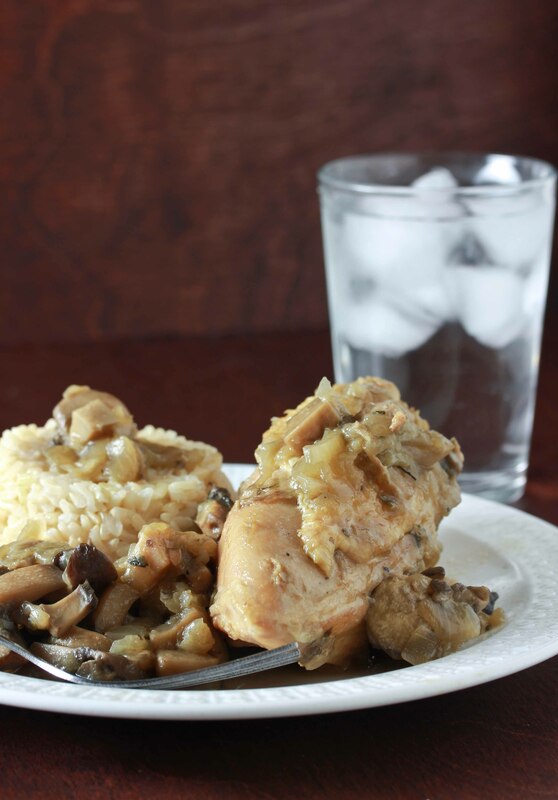 been looking for chicken mushroom recipe, perfect! I’m putting this on a stickie! I love mushrooms and this looks amazing! I am going to make a parve version of this with vegetables this week, it sounds delicious! I didn’t have enough mushrooms, so I added some zucchini and carrots too. It was AMAZING! The pot was licked clean! Thank you so much for sharing! Hi Miriam, I loves braises, especially in cold weather and this one looks great! Yum – I am totally going to try this tomorrow! Can I cook the chicken in the oven the last 1.5 hrs instead of on the stove? Should be fine! Cover it! Thx, I’ll post on wfs how it comes out! Would love to make this for yt. Can I do it with chicken breast? How long would I cook it for? You can but watch that they don’t dry out. I’ve done it b4. Came out gr8! Hi, I already bought chicken shnitzel. Will this recipe work with it? You can try, but you’ll have to reduce the cooking time or they will dry out. how much time would this recipe need in a slow cooker? I followed this recipe (I even had it cooking for less time) and the chicken came out very dry. Any idea what I could have done wrong? Hi!! Did I read somewhere that this dish freezes well? Thank you!! Smells delicious as I’m cooking it now. Do you cook it for less time if you freeze it?